Waco biker gang shootout, at least 165 arrested: Police had prepared for trouble but couldn't control gunfire. Police investigators at the scene of Sunday’s shooting. Update, 1:55 p.m.: Twin Peaks’ corporate office has revoked the franchise rights of the Waco restaurant where the shootout took place, writing that the outlet ignored “warnings and advice from both the police and our company” that its cultivation of gang-affiliated bikers as patrons was creating a security problem. The Texas Alcoholic Beverage Commission had already ordered the restaurant, which was scheduled to hold a bikini contest on Wednesday, shut down for seven days. Original post, 12:43 p.m.: Police estimated that they arrested a staggering 165 to 175 individuals in the wake of a shootout among motorcycle gangs that left nine dead and 18 injured at a Waco, Texas, shopping complex, officials said Monday. The violence began Sunday about noon, and suspects were still being booked as of Monday morning. The incident began at and took place in and around an outlet of a breast-themed establishment called Twin Peaks, which is reportedly the fastest-growing restaurant chain in the United States. 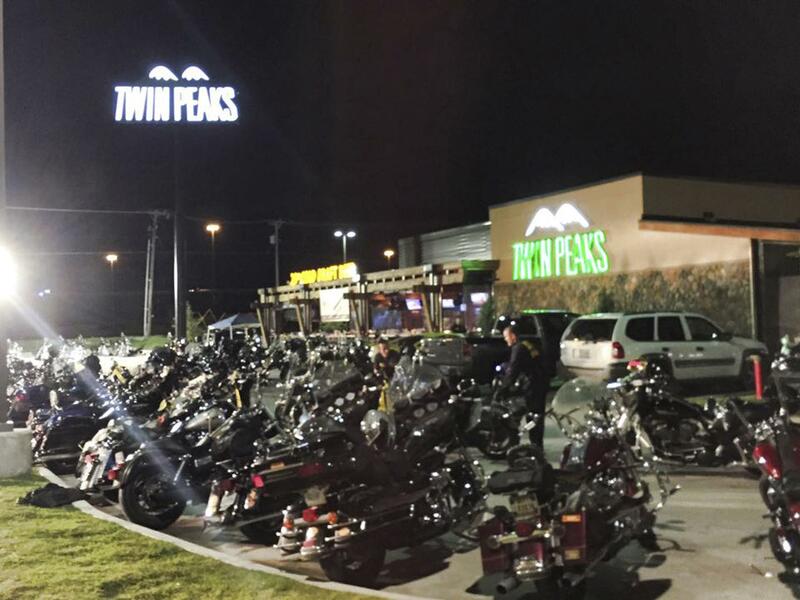 A spokesman for Twin Peaks says the company is “seriously considering” revoking the franchise rights of the Waco restaurant, which was reportedly uncooperative with local authorities who had become concerned before Sunday’s shootout that it was becoming a gathering place for gangs. “There is blood everywhere,” a Waco police spokesman said of the crime scene. Less seems to be known about the Cossacks than the Bandidos; a source in the Post’s piece suggests that the Waco violence may have been precipitated by a potentially threatening alliance between the Cossacks and the Hells Angels, a major Bandidos rival. The AP notes that “a 46-year-old from Abilene who police say was the leader of a West Texas Bandidos chapter” was accused in November 2013 of stabbing two members of the Cossacks in El Paso. Signs for a nearby Bed Bath & Beyond store can be seen in CNN’s images of the Waco crime scene. In a further bit of surreal incongruousness, the Department of Justice refers to criminal biker gangs as Outlaw Motorcycle Gangs, or OMGs.